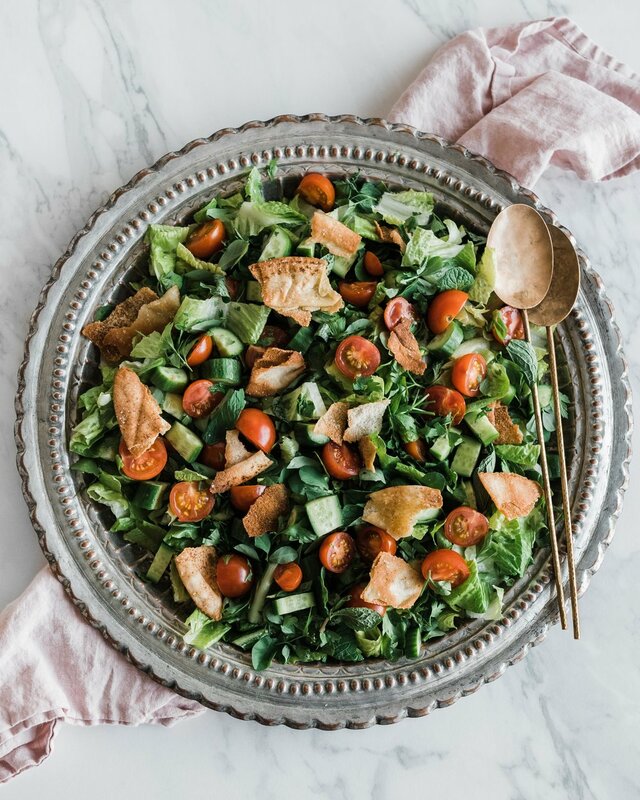 Today I’m sharing fattoush, or Syrian bread salad. Fattoush is a common mezze (or appetizer). It’s made by combining pita chips, herbs, mixed greens and an assortment of different vegetables. I love the combination of the herby and fresh vegetables with the tart and sweet dressing and the crunchy homemade pita chips. There are 2 ingredients that make this salad extra special: sumac and purslane. Sumac is a lemony red, purple-ish powder that’s used to flavor meat and vegetables. It grows wild in Palestine and is the main ingredient in their famous chicken dish msakhan. We love to use the spice on fattoush and sometimes garnish hummus with it. Purslane is another must-have ingredient. Some fattoush recipes try to simplify by leaving it out, but my mom refuses to make this dish without it. Its leaves are super tender. 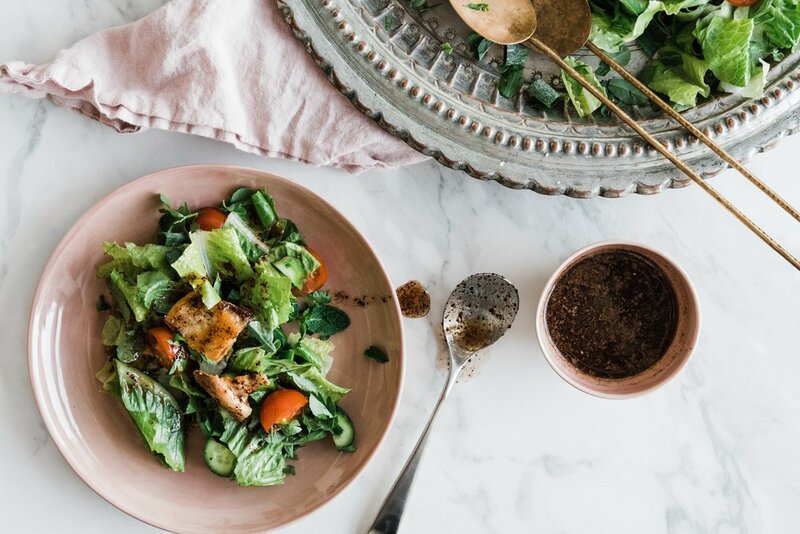 It’s sour, it’s salty, and pretty much the perfect accompaniment to this salad and anywhere else you might see greens (i.e. sandwiches, other salads, etc.). In Chicago, I often found it at the Mexican or Middle Eastern grocery store. In Dubai, it’s prevalent pretty much everywhere. It’s peak harvest season in Dubai, so these vegetables and herbs are extra fresh this time of year. If it’s bitter cold where you are, invite a bit of summer into your home! Serve it alongside grilled meats, with vegetarian mezze or anything else your heart desires. If you try the recipe, don’t forget to put it in the comments and tag @omayahatassi and #omayahcooks on Instagram. Start by making the pita chips. Preheat the oven to 375 f (190 c) and line a baking sheet with foil. Toss the pita chips with the olive oil and season with salt. Toast in the oven for about 7-8 minutes, flipping once, until golden brown and crispy. Let cool. Combine the dressing ingredients in a glass jar and shake to combine. Add the veggies and herbs to a salad bowl. Just before serving, add the dressing, a little bit at a time until you feel you have enough dressing and toss to combine. Top with pita chips. Salad (up until tossing with dressing) can be refrigerated up to 2 hours ahead. Pita chips stored in an airtight container at room temperature up to 3 days. Dressing can be refrigerated for 5 days. Sign up for a backstage pass and recipes delivered straight to your inbox!